The Market Basket Dairy & Frozen Foods Department is one of the busiest aisles in the store. 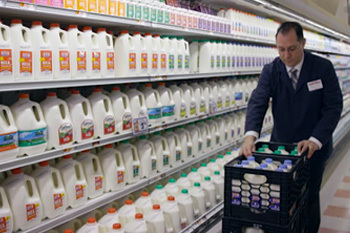 Milk, eggs, butter, yogurt, and juice are items that all customers want in their carriage. Our dairy department works with partners locally, nationally, and globally to bring you variety, quality, and value. 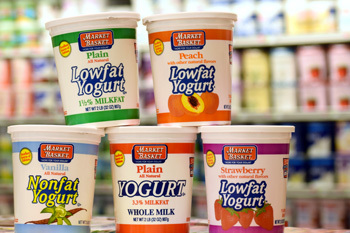 Our yogurt selection is endless! We offer your favorite brands, flavors, and sizes. These offerings including traditional, Greek, Icelandic, organic, dairy-free, and soy. We have drinkable yogurts as well as kefir probiotics to satisfy your wellness needs. Alongside our shelves of yogurt, you will find our wall of shredded, sliced, and bar cheeses. Make your way down the aisle, and you will encounter our selection of refrigerated beverages including juices, coffees, and teas. Be sure to shop our milk and eggs. As the milk category evolves, we will always have the item for you: conventional milk, organic milk, almond milk, cashew milk, and soy milk. Swing by and check out our assortment of eggs. We have all sizes and varieties: medium, large, extra-large, and jumbo. Whether you're looking for white, brown, cage-free, or organic—everything is in stock for you. There are over 5,000 items in our frozen foods department. From fruits and vegetables frozen at their peak flavor to our seemingly endless variety of ready-to-heat pizza, our freezer section has it all. Our organic, gluten-free selection is always expanding to ensure you will find what you need. 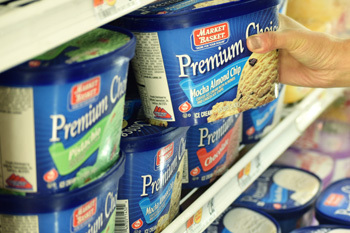 Our ice cream section has all of your classic favorites, as well as new items, at "More For Your Dollar" value. All the items you used to get from the ice cream truck can be found in our ice cream department.